After performing her thought-provoking and stirring poem at the swearing-in of President Muhammadu Buhari on May 29, 2015; a historic moment for the country and the first time a poet had ever been invited to perform at a Nigerian inauguration ceremony, Titilope Sonuga achieves another first. 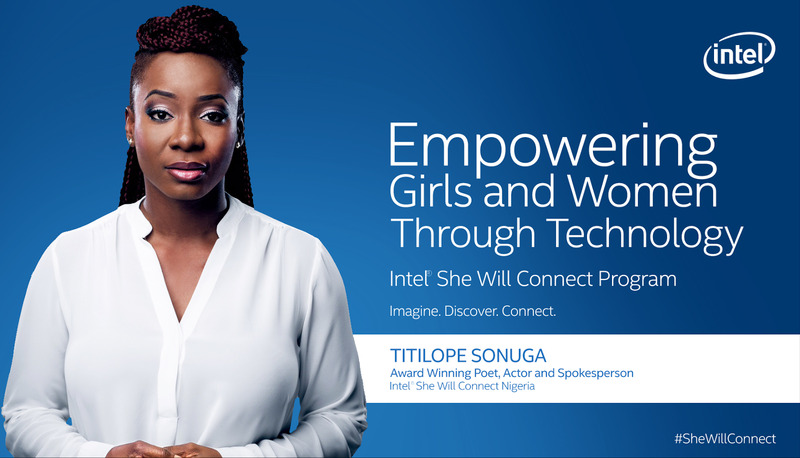 She has been named the first Intel® She Will Connect spokesperson in Nigeria. Titilope Sonuga is an award winning poet, writer, actor and civil engineer whose work has graced stages and pages across Nigeria and internationally. She performed in the first spoken word showcase at the Chinua Achebe Colloquium on Africa at Brown University alongside world renowned poets and was selected from over 200 poets to meet the iconic American poet and activist Dr. Maya Angelou. She plays the role of "Eki" in the Ndani TV hit television series, Gidi Up. Her year as the initiative's spokesperson will kick off with a Radio tour with representatives from various NGO partners to speak about their work through the initiative.